Jean Kazez: Is Worship Morally Wrong? (1) If there is a god, then there's something we should worship. (2) There's nothing we should worship. (C) There is no god. (1), they say, is true by definition. God (on the sort of theism they're examining) is all-knowing, all-good, and all-powerful and something humans are obligated to worship. (2) is a moral claim which they defend by making worship out to be something tremendously self-abnegating, and so inconsistent with human dignity. I think Jews and Christians (I don't know about Muslims) will simply reject this account of what worship amounts to. Reread the last sentence. It makes it look as if God orders us about all day long. There's no reason why theists should understand God this way. In fact, the idea that God made humans "in his image" doesn't comport with the idea that we are robots under his constant command. No, we are like him--we are self-governing. If he does issue some commands--"thou shalt not kill"--how does it compromise human autonomy for us to "have to" obey them? On any objective morality, there are things we "have to" do. On the other hand, if we must define "worship" in this extreme way, I'd just reject (1), if I were a theist. No, it's not a part of the concept of God that we are his slaves. Note: it's "God the father" not "God the master." So: the argument seems easily dismissed by theists. And yet, and yet. I think Aikin and Talisse do raise an interesting question. Namely: what is this thing called "worship" and how could it be good, not bad? Even if worshiping God is not a question of constant servility, how could it be self-respecting to prostrate yourself even just by bowing your head at a religious service? Isn't even that a bit servile--so a bit bad? Then again, is "worship" even a necessary term? Perhaps the state of mind in a church or synagogue can be reverence--a much less submissive thing than worship. One could say congregants are experiencing a brief interlude of humility--and isn't it positive to periodically practice that virtue? Are they being slavish (bad) or are they briefly putting aside self, and focusing on the community? If you're entirely focused on the words of liturgy, you'll think worship is grovelling. But if you think about what people are actually experiencing, it may be something else. Now I will "confess": I personally do not worship--I just can't do it, because I think there's nothing to worship. But I actually like being part of a worshiping group, at least from time to time. This is what always strikes me: the people in my particular reform Jewish congregation are movers and shakers. Every other day of the week, they have lots of individual power and wealth. Yet they come together and in some sense lower themselves, becoming just one member of a group. Standing to show respect, bowing, and various other acts, are ways of acting out this focus beyond the self. I find that just the opposite of repellent, and actually moving. So--is worship incompatible with human dignity? It depends enormously on what worship is. 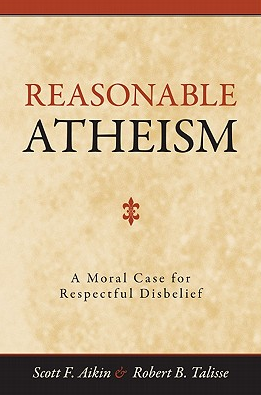 I think a "reasonable atheist" will not jump to conclusions. I'm not even sure why obedience is bad. We have to obey the laws. Is that bad? In many situations, we have to obey what authorities say, independent of the details of the law, for example, in the Armed Forces, in emergencies (obey the police, firefighters, etc. ), if we are hospitalized (doctors' orders). If God were the all wise, benevolent master of the universe, it would make sense to obey Her, just as it makes sense to obey the doctor's orders (without questioning them) if one is in a hospital emergency room with the symptoms of a heart attack. Well if Islam means submission to the will of God , even if some of them reject it , its on theologically poor grounds. If he does issue some commands--"thou shalt not kill"--how does it compromise human autonomy for us to "have to" obey them? On any objective morality, there are things we "have to" do. According to Kant (at least on my reading), humans must be self-legislators of all the laws they obey, if they are to be autonomous. So there'd be a tension with the idea of God setting commands that we do not set ourselves. And also an explanation, if Kant's theory works in the end, of how there can be things we "have to" do that are yet consistent with our autonomy. I agree with your view of worship. About Kant - if a person looked inside and believed certain laws were worth following, would they then believe also that the "follow-able" ones must be from God and the others not really, so there'd be no conflict? I think Kant would see moral principles as simply rational. If God is rational too, there's no conflict between what morality dictates and what God prefers. So morality is not "from God," but it's God-approved! I think it is good that there's some philosophy of religion (not theology) being done about the practice of religion, rather than things like proofs for the existence of god or even universalism. "Now I will "confess": I personally do not worship--I just can't do it, because I think there's nothing to worship." I think this is really the rub: and it hits the central problem for relgion in the age of naturalism. When we conceive of God as being an existing being, and independent thing, a super agent the sits over and above us, then it is possible to think: well what if this or that particular version of this independent super thing simply isn't there at all? In fact this is always been the case interreligion as each religion claims that the other religions have gotten some key set of facts wrong. God is ONE. No he's THREE. No he's MANY. He chose THIS people. He sent THIS prophet. He sits APART from the world. No he is IN the world. No he's not a he but rather a SHE. etc. But it's not just that "God" is our physical image writ large, though very obviously (even comically) that occurs as well. More importantly "God" is our moral codes writ large. Our hopes and dreams of how we ought to be, could be, should be. The call to worship will never end because until such time as we view moral codes as PURELY relative to the whim of every individual they (our moral commandments) will still make demands on us that come from the outside. We must bend knee to them else they are not "oughts" at all. "God" is just a useful anthropomorphization of "Goodness." It's us "drawing" our ourselves in transcendent ink.